I have 5 stamping pates to show you today, they all from Bundle Monster and they all related to sports. I did 1-1 nail art for each, and they might seems too much as a manicure, but I tried to use as many patterns as I could, so you can see the potencial of each plates. I'm not a big sport fan btw., but I love dancing, so the first plate is really calls my name! 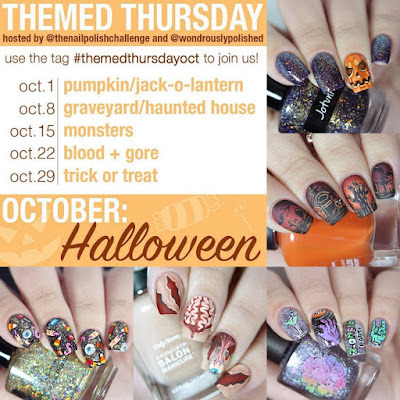 I tried out a new challenge this month called Themed Thursday. Two of my fave nail girls started it, @thenailpolishchallenge and @wondrouslypolished. The main theme was Halloween, so that's why I choosed this challenge instead of my regular WNAC. This nail polish waited so long to be swatched, I can't even remember when I bought it, but probably it was on sale at Nailland at some point, and bought it because I like greys. I'm still a little bit overwhelmed in the nail art front because the 31 day challenge, so I did a lot of swatching lately. But yesterday night I had the urgent need to paint something nice on my nails. Today I'm going to show you a collection called Sugar Skull from Envy Lacquer. I already showed you the Fall Rock Candy Trio, and now let's see this cute 6 piece collection! I have these nail polishes since May, and finally I had the chance to swach them. I swatched Morgan Taylor polishes before (if you missed them, you can read my reviews HERE), and these 4 beauties are just the same amazing quality that I'm used to when I paint my nails with a MT. Today I have a studded nail art for you to show. I rarely do this kind of nail art lately, I just totally fell in love with freehand, so it was a little bit refreshing to do something different. I got these awesome abalone nail decorations from Born Pretty Store and I thought I will use some gold studs and caviar beads with it. Envy Lacquer is an indie brand from America and I'm going to show you the Fall Rock Candy Trio today. I also got the Sugar Skull collection for swatching, so I'm going to show you more Envy Lacquer beauties next week! I did these nails a couple of days ago, and I'm totally loving them. I like to do plaid nails in the fall, they just feel appropriate :D I saw @kgrdnr Kristin's plaid nails a couple of weeks ago, and since then I wanted to do something similar. I especially fell in love with the colours. I have some Avon newbies to show you today. The Nailwear pro+ line got 6 new shades and there is a new collection called Molten Metal with 5 awesome metallic colours. I'm gonna show 2 from the Nailwear pro+ and 3 from the Molten Metals. You're probably remember these leaves, because I painted them before, in THIS manicure. Last weekend I wore Spiced Eggnog from ILNP again, and I thought I will decorate it with something autumnal. And of course, leaves were the first thing that came to my mind. 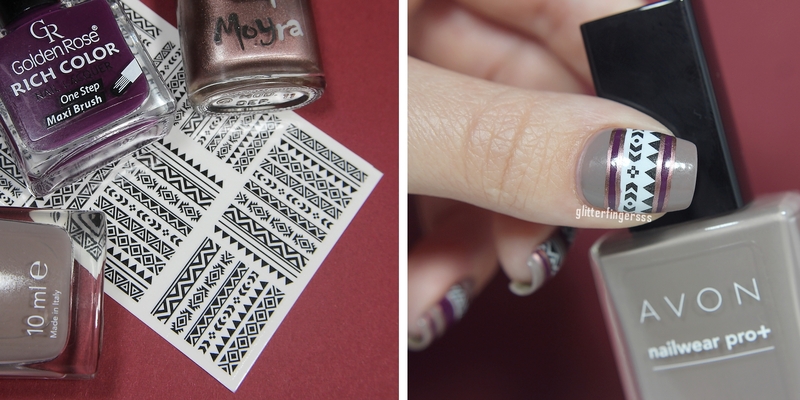 I like to make tribal nail art in the fall too, not just in the summer. It can look awesome with the autumn colour palette. I got these water decals from Born Pretty Store to review and I fell in love with them in the minute I saw them. I have some swatches of the aussie indie brand, Urban Nail Art's Dance Raven collection, which is a 6 piece collection full of glitter holos. Nailland was kind enough to send me one of the new piCture pOlish collaboration shades to try it out. New York was created by Sisi from the webshop Color4Nails. Nailland had a great news a couple of days earlier: a new nail polish brand will be available: Cirque Colors! The pre-order will finish on 05.10., and we can have 5% off from the original price. This great news was the final push to swatch my very first Cirque polishes that I bought a couple of months ago from Harlow&Co.